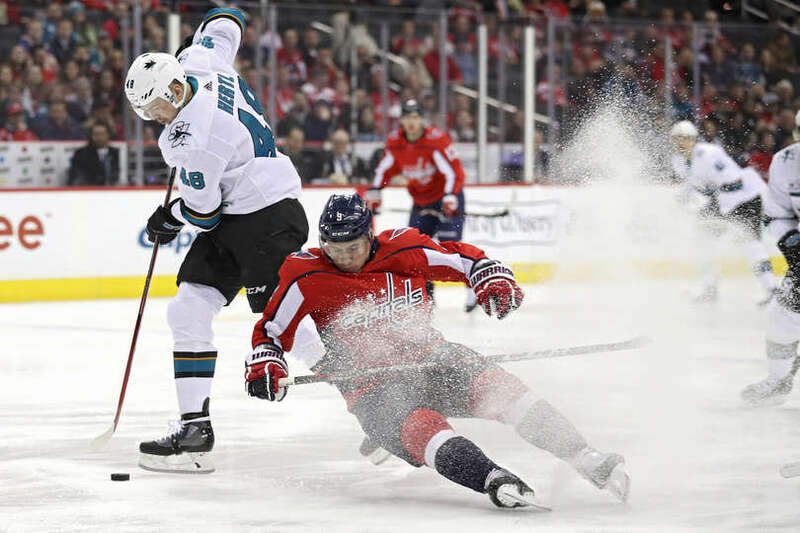 The Washington Capitals fell to the San Jose Sharks 7-6 (OT) Tuesday night at Capital One Arena. The loss drops the Capitals record to 27-16-6 (60 points). 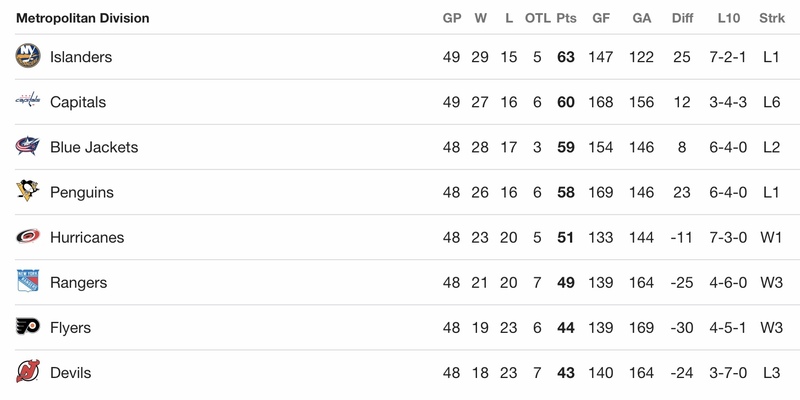 The Capitals are now off to Toronto to face the Maple Leafs Wednesday night. Puck drop is set for 7:30 PM. San Jose wasted just 12 seconds in taking a 1-0 lead in the first period, but Alex Ovechkin would notch a power play goal to tie the game at the midway point of the period. Andre Burakovsky would give the Caps a brief lead before the Sharks answered with their own power play goal to make it 2-2. T.J. Oshie would finish a breakaway to give the Caps a 3-2 lead at the first intermission. The Sharks would quickly tie the game at the start of the second period, but the Capitals would answer with goals from Evgeny Kuznetsov and Alex Ovechkin to take a 5-3 lead. Logan Couture would finish a 3-on-0 for the Sharks to make it 5-4 at the second intermission. The Capitals would stretch their lead to 6-4 with Alex Ovechkin’s third goal of the game, but the Sharks would answer back with a power play goal midway through the final frame, making it 6-5. The Sharks would tie it with one second left in the game with a goal from Evander Kanes, sending the game into overtime. The Sharks would win it in overtime with a goal from Tomas Hertl, his third of the game. The Capitals fall 7-6. Scratches: Madison Bowey, Nic Dowd and Devante Smith-Pelly were the healthy scratches. The Sharks would register the game’s first tally just 12 seconds into the contest. Joe Pavelski would find the back of the net from close-range to make it 1-0. A Sharks shot from the point took a bounce directly to Pavelski for the score. The Capitals would tie the game with a power play goal from Alex Ovechkin at 10:41 of the first period. Nicklas Backstrom and T.J. Oshie were credited with the helpers. The Capitals would grab their first lead of the game with a snipe from Andre Burakovsky at 12:11 of the first period. Chandler Stephenson and Travis Boyd were credited with the helpers. But the Sharks would get it right back with a power play goal of their own. Tomas Hertl would tie the game at 14:27 of the first stanza. The Capitals would retake the lead moments later on a breakaway with Ovechkin and Oshie, with Oshie providing the finish at 15:19. The first period would end with the Capitals leading 3-2. The Sharks out-attempted the Caps 18-16 and led in shots on goal (SOG) 15-13. San Jose was 1 for 2 and Washington was 1 for 1 on the power play in the first frame. The Sharks would tie the game with a power play goal just 52 seconds into the middle frame. Evander Kane would clean-up the loose change for the tying tally. Evgeny Kuznetsov would grab the lead back for the Capitals at 2:53 of the second period. Jakub Vrana and Tom Wilson would be credited with the helpers. The Capitals would stretch their lead to 5-3 with Alex Ovechkin’s second goal of the evening at 5:41 of the second period. Nicklas Backstrom and T.J. Oshie were credited with the assists. The Sharks would cut the Caps lead to one with a 3-on-0 break away finished by Logan Couture at 14:39 of the second period, making it 5-4. The period would end with the Capitals leading 5-4. The Capitals outshot the Sharks 17-15, but the Sharks led 13-12 in SOG in the middle frame. The Capitals would stretch their lead to 6-4 with a goal from Alex Ovechkin, his third of the game at 5:52 of the final frame. This was Ovechkin’s 23rd career hat trick. But the Sharks would respond with another power play goal from Tomas Hertl at 10:02, making it 6-5, Caps lead. The Sharks would tie the game with one second left in regulation with a goal from Evander Kane, sending the game into overtime. The Sharks would win it in overtime. Tomas Hertl would win it with his third of the game at 1:48 of overtime. Alex Ovechkin scored three goals in the game. That marks his 129th career multi-goal game and 23rd career hat trick. Andre Burakovsky gave the Caps a 2-1 lead with his sixth goal of the season. Burakovsky now has three points (1g, 2a) in his last two games. This entry was posted in Game Re-Caps, News and tagged Alex Ovechkin, Alex Ovechkin Hat Trick, Andre Burakovsky, Evgeny Kuznetsov, Jon Sorensen, San Jose Sharks, T.J. Oshie, Washington Capitals. Bookmark the permalink. 12 secs in … another game giving up the 1st goal… up 2 in the 3rd and tying goal with 1 sec remaining… stupid!